Most of the behaviour for the nightclub jobs was actually split across 4 plugins rather than in SimAntics scripts, causing a few issues that delayed its development. The first was the need for plugins to be supported in the first place – these are hardcoded “server in a server” setups that allow complex interactions and UI interaction directly from players, such as the pizza maker and code job objects. The problem is that these do not have scripts that can be interpreted and run to mimick the original game exactly, they must be recreated from scratch as hardcoded plugins within our engine. This plugin system did not get implemented until much later in development – months after the robot factory and diner jobs were playable in sandbox instances. The second biggest problem was that no footage of this job exists. None – it is completely lost to time, and until someone emulates the original game, nobody will know exactly how it played in the first place. This was componded by the fact that nobody knew how the original worked, since it gave very little feedback about how good you were doing your job… Therefore, it was up to me to define my own scoring mechanisms, and my own way for the dance floor to behave (to hopefully give people a better idea of how they are playing the game). So I finally decided to put the effort in, and the result is something that’s both incredibly unique and different from the other jobs, and a lot more playable than the original in the eyes of our testers. 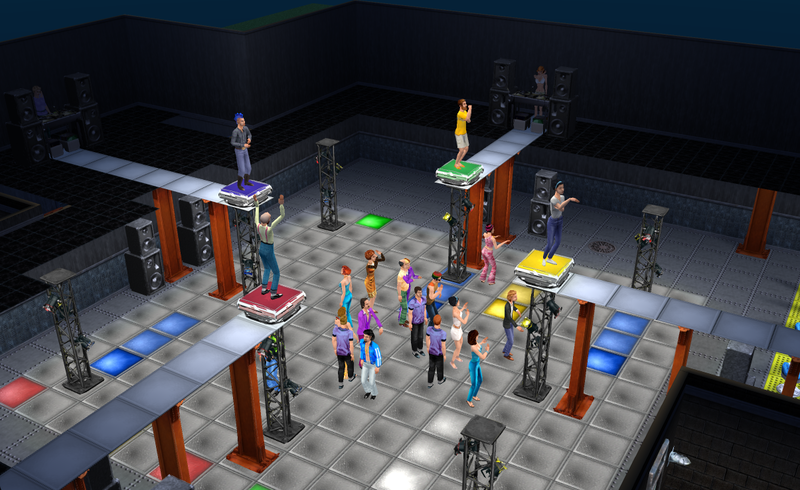 The original required a ton of shots in the dark, but our gameplay rewards careful attention to the dancers (dancer job) or dance floor (dj job) with a large number of simoleons. There is a lot more risk vs reward in this job since you can get paid very little with poor performance, and compete directly with other players at your job lot, but the result can be a much greater payout than the other jobs offer. Last month was the years anniversary of the official launch of our beta server, and a lot has changed since then! 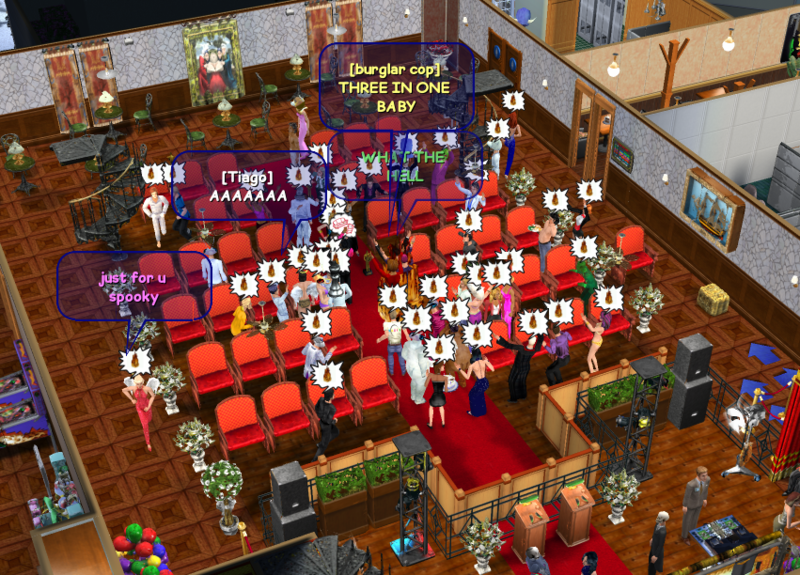 We hosted a pretty crazy event where community members could nominate each other for awards – for categories such as Party Animal, Tombstone Generator (won by “Die”, fittingly), Best Hostess and more. We even created a set of special lot miniature awards, for the best voted lot in each property category. Campaigns were run, casinos went to war, and Chompers was robbed, but all in all it was a ton of fun running the event and we hope to do more like it in the future. The event was hosted in our Town Hall lot in the middle of sunrise crater, and had 128 players present for the majority of the time! Apart from some initial server issues when everyone was mass joining, which we hoped to find with this event, the event ran well. These issues have hopefully been fixed – we’ll be hosting another large scale event soon to confirm that the issues have been addressed. Of course, the town hall is a special kind of lot that can be opened by anyone, so feel free to use it for your own large scale events – you can even advertise them in our discord if you like. Our new chat dialog, with a few test channels. Chat is arguably the biggest aspect of the game. It allows communication and interaction between roommates and visitors, co-ordination of group job objects, and casual conversation. It has never been perfect, though – normal gameplay with the pizza and maze objects involves sending a ton of messages in the chat, which would make the chat history a lot harder to use for people to just hold a conversation. To avoid this problem, people would open up a ton of private conversations to the other players and send messages to everyone individually. To solve this problem, I added “Chat Channels”, which will allow you to create additional chat channels with different colours, optional text to speech, send and view permissions, and the ability to hide their messages at will. For pizza and code, you can send your messages to a dedicated channel that is hidden by default for everyone else – that way you can coordinate pizza easy and everyone else can chat! This also solves another problem – large scale events. If you have a lot full of say, 128 people, and there’s one important speaker running the event, chat channels can allow you to separate these important messages from the reactions of the 128 players. 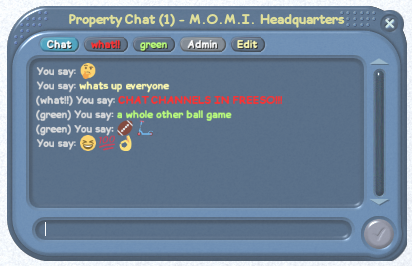 An event chat channel could be visible to everyone, with a special chat colour and tts, but messages in it can only be sent by Roommates. That way, the important messages are a lot easier to find (users can hide default chat), and the chat still remains unrestricted to everyone else. The channel edit window, showing the current options. The description appears as a tooltip when you mouse over the channel. 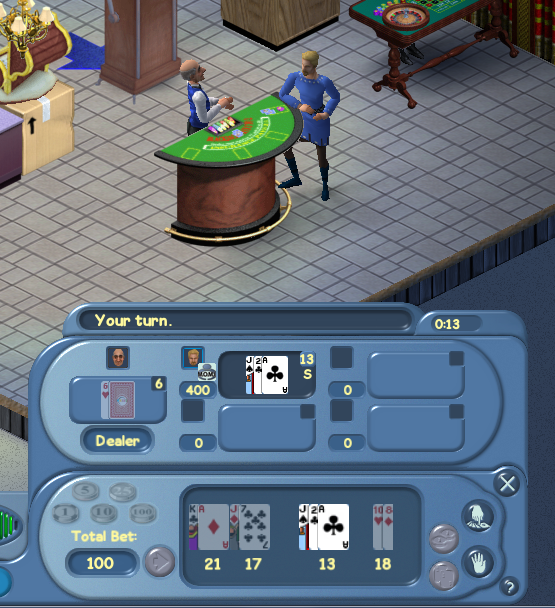 In a really surprising twist, our recent contributor The Architect has created an entirely new casino object and UI, that only existed in the original game as some unused object sprites and animations. The UI and functionality are entirely designed and implemented from scratch – with no reference to follow from the original TSO – and it plays brilliantly. Get down to a casino lot to try it yourself, and make sure that you double down whenever you hit 18 or over. It’s always a great idea. As mentioned in the last post, 3D remeshing is a large scale community effort aimed at remaking 3D objects from scratch, either by using the original sprites as a texture or entirely custom ones. This results in a much cleaner look than the generated meshes provide, pushing the mode way past just being a technical proof of concept or ease of use feature, and more like a polished, natively 3D game. This above remesh is by one of our most active community members, Alex, though many other contributions have been made or are in progress since the last post. Check up on http://forum.freeso.org/forums/3d-remeshing.40/ every once in a while to see the latest models, though our discord is usually a lot more popular. You can now also download these remeshes directly from the launcher! Personally, I can’t wait for the future here. 3D mode is still being actively improved every update, with some large scale changes planned in the next few months that should really complete the experience. Our more recent moderators, S1ndle and Raeven, have been designing and scripting a ton of original objects for the game, even including an NPC for our community lots. We’re rebooting translations to get the game accessible in more languages and there have been a ton of contributors – though we still need a few extra systems in place before translations become entirely painless. There will be more on this later! FreeSO was in development for a rather long time before our beta testing server launched, and was even played by a tight-knit community in a “sandbox” mode, used to test the game’s objects and base systems. First implemented in July of last year, the networked sandbox mode let people connect directly to other players (given manual port forwarding) to test out interactions, and chat on the same property. Over time this expanded to include build/buy, permissions, an entirely new routing system, a ton of bugfixes and “plugin” objects such as signs and the pizza maker. The freeso ml team not only hosted the longest running always-on sandbox server, they also engaged and entertained a community of players for a game that was not even close to completion. The players contributed an invaluable number of bug reports, feature suggestions, and made several great properties that tested the absolute limits of the engine. 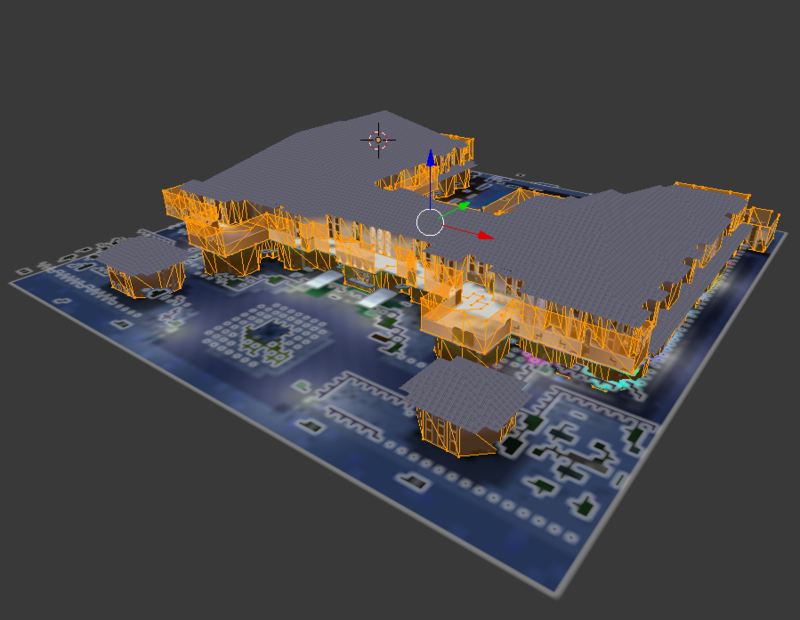 Therefore, our first anniversary object was a 2×2 tile replica of FreeSO ml’s longest running map, the “v2” iteration. 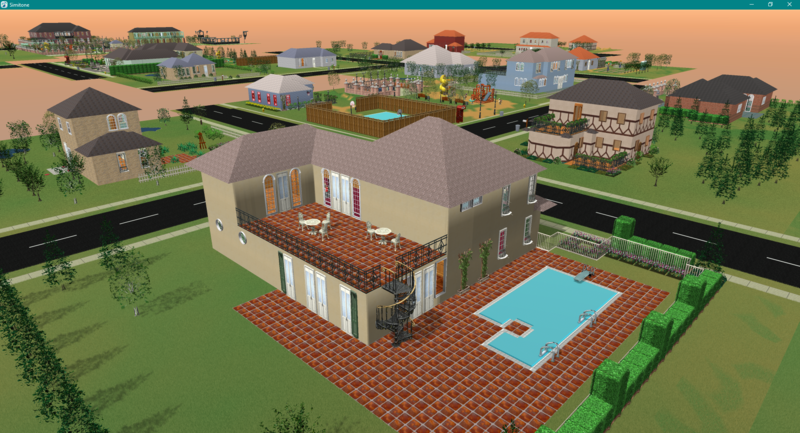 This property showcases a variety of houses built by regular players, as well as a few apartment and community buildings that were populated with players who played for shorter bursts of times. 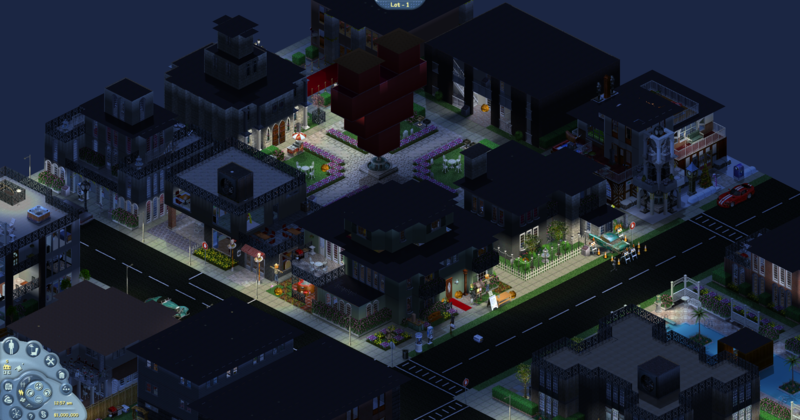 This representation is rendered directly from the game client using our new lot facade generator, which can generate low poly and texture models for any lot in the game on demand. This object is not tradable, and will carry over into the release server through a migration process. It will be available from the 8th February through the 15th. Regarding sim birthday gifts, these can be implemented too in the future, not right now… though rest assured when they are, gifts for birthdays that have already passed will not be missed. No reason to have this pic here, it’s just amazing. ← Merry Christmas from the FreeSO Team! I won’t be reading this blog post due to all the icons / emojis. It is frustratingly unreadable and not an effective form of communication. It might look cute but if I have to decipher and break the code to figure out the information you wish to provide, then it’s a big fail. Love everything else you do for FreeSO and all the amazing work that you and all the others have put forth to bring this game back to us fans. Thank You! I think she’s talking about the April Fools thing. We weren’t able to put anything other than emojis in the chat. Wow, how insane must it feel to show up at the annual awards show of your own project and just live up the moment like a god. 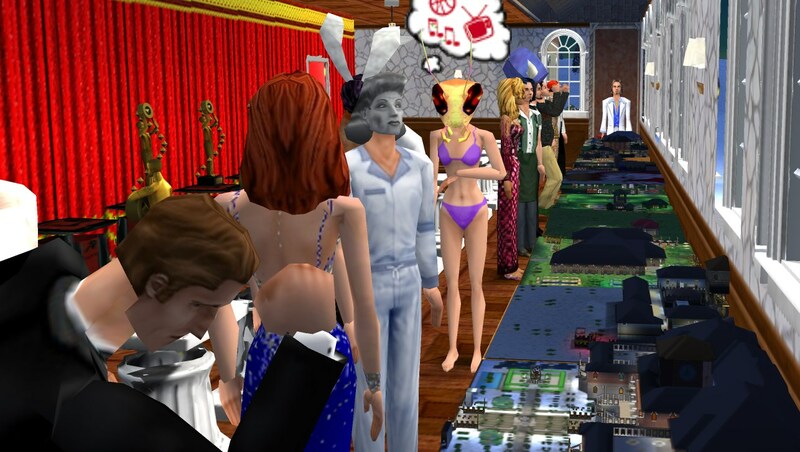 How is it that the sims community has been blessed by such an ambitious team. There’s no way he’s teasing sims 3 style open world at the end… right? I wouldn’t be able to contain myself. Making neighboring houses more interconnected would just be unreal. Personally though I wonder if there’s ideas flying around about incorporating random events like npcs/animals/ghosts/thieves roaming in and out of the scene. I’m guessing these weren’t in the original, but it’s the one thing outside of expansion pack towns that’s stopping me from dropping sims 1 completely for freeso.